I know there are lots of articles about colds and flu out there. Unfortunately many of these articles have a this for that approach. Have a sore throat, take this. Have a cough, take that. Have a fever, take this. Granted, this type of herbalism is sometimes successful. But many times it's not and it can be frustrating for the person who is wanting to avoid over the counter medicines or convince their family that herbs really are the way to go. This article on using herbs for colds and the flu is not just about using this herb for that condition. We'll also take a basic look at the energetics of an acute upper respiratory infection and look at the herbs specific to those different patterns. We know that not all colds or all the flu are all alike. Not all coughs are alike, not all fevers are alike. Therefore let's use herbs that are specific to the symptoms of the person, rather than a catch all. This way we'll be fare more effective! In this article we are going to look at prevention and treatment of colds and flu using simple to make herbal remedies. While this article is mainly about medicine making we’ll also briefly look at basic energetics of the common cold/flu so that we can better choose herbs for the symptoms. Before we get to the article, you may want to check out some other posts I've done about using herbs for the cold and flu season. Certainly, the best way to prevent colds and the flu is to live a healthy balanced life. Eat fresh whole foods, breathe clean air, live a fulfilling life, get appropriate sunlight exposure and enjoy rigorous movement every day. Of course food and herbs can have a major role in preventing illness. Nutrient dense foods keep us overall strong and healthy, while some foods like shitake mushrooms or spices like turmeric and garlic, can be eaten regularly to support our immune system. At our house we love chai teas. Many roots that we regularly take are thrown in the chai pot. 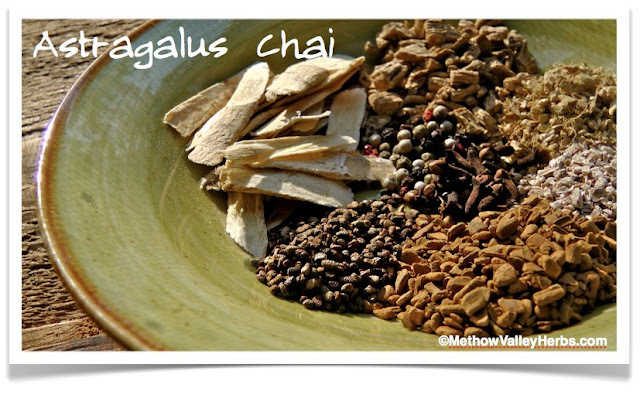 Here’s a variation of one of our favorite immune supporting chai teas. I then strain the tea off and pour it into a mug until the mug is 3/4 of the way full. Then I add some type of milk for the last 1/4. Yummy! This is something I will drink every day for long periods of time. If preventive methods fall through and you are dealing with an onset of illness, rather than choosing herbs to treat a generic cold or flu, I suggest you learn basic energetics to help choose something more specific. In Traditional Chinese Medicine acute conditions (like a cold or the flu) can basically be seen in two different categories: External-Wind-Heat or External-Wind-Cold. This is essentially understanding whether there is more heat present or if there is more cold present. The following is a very basic overview. Whenever I deal with energetics I never want to get too dogmatic or overly theoretical. 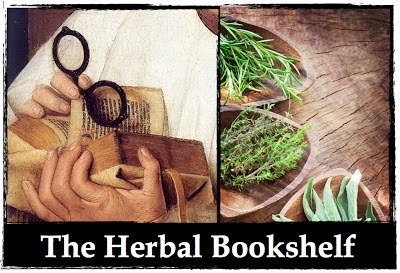 The whole point is to find herbs to match the person so that person can find quick relief. I am not the kind of herbalist who splits hairs (although I admire those who can! ), instead I am looking for general patterns as a guiding stepping stone. A person who is displaying more cold symptoms will have more of the following symptoms. Our strategy here is to increase warmth and circulation. I am absolutely smitten for ginger. Talk about an herb that can do it all! If I am feeling chilly with the onset of a cold or flu, this is the first thing I reach for. Simmer these (with a lid) for twenty minutes. Strain and drink. Warning! this is not your afternoon cup of tea. This is a very spicy brew. If needed add some lemon and or honey to taste. Wear a scarf, hat and other warm clothes while drinking. Inducing a person to sweat is a very traditional method used all over the world to promote circulation, ward off a cold, flu and other illnesses or even for spiritual purposes. Sweating can be done as a dry or damp heat, depending on your set up. At home I use damp heat. I simply fill a large basin with just boiled water and place it underneath a kitchen chair. Then sitting on the chair I wrap a sheet and then a thick blanket around me. The blanket is wrapped around my neck, allowing my head and face to be outside of the ‘steam room’. The blanket needs to touch the ground completely to avoid loosing the steam. You might play with this a bit to figure out how much steam you want for a desired temperature. It’s very important that you keep hydrated before, during and after this process. This treatment is not appropriate for people who feel weak or who are dehydrated. A good rule of thumb is to try this for 20 minutes and see how you feel. Stop the treatment if you feel faint or weak. When you leave the steam room do not allow yourself to get chilled. Crawl under dry covers or put on a fresh set of clothes. 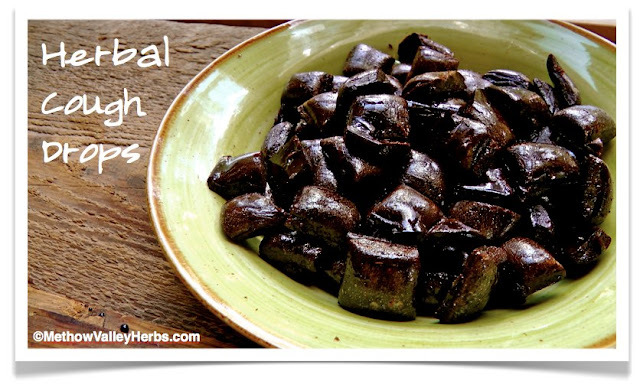 Thompson’s original recipe calls for hemlock bark which is not commonly available. The following recipe comes from the course materials at the East West School of Herbology and uses white pine bark as an alternative. The following herbs are all powdered. Once the powders have been mixed together, take one teaspoon of the powders into one cup of hot water. You may want to start with less! A person with more heat symptoms will display more of the following. Our strategy here is to cool the body and release excess heat. In a western frame of mind, anti-inflammatory herbs can be very useful here. No great medicine making skills here, but all the same, elderflower is by far my favorite remedy for a cold or flu with symptoms of heat. I make this fairly strong by infusing one cup of the flowers into a pint of just boiled water. I often add rose hips, peppermint and yarrow to the mix as well. (A classic western formula). Steep for 30 minutes, covered, strain and then sip frequently. Boneset is disastrously bitter. Be prepared for something that works, but tastes absolutely awful! Let steep for 30 minutes to four hours. Strain and then sip slowly but frequently over a period of time (can cause nausea if you drink it too fast). Coughs can sometimes be the most debilitating part of a cold or flu. Persistent coughs can keep someone from sleeping and cause a lot of pain. Generally we don’t want to suppress a cough unless it is a last resort to restore someone’s sanity. 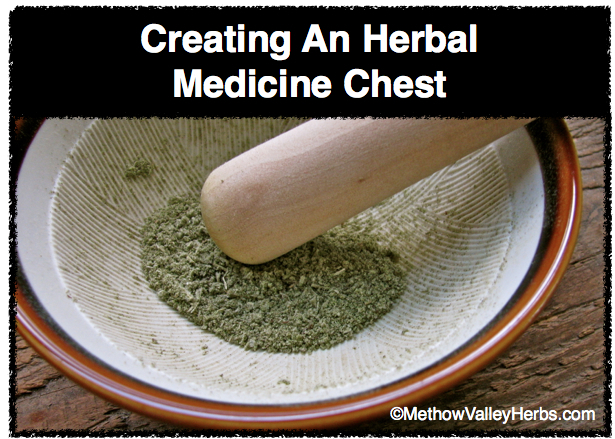 Instead we may employ herbs to support a cough, thus helping to relieve it. A conversation about herbal stimulating and relaxing expectorants as well as demulcents and anti-spasmodics could be an article in itself! Instead I leave you with this recipe, a hard candy type cough drop, great for those tickly, persistent coughs that can keep you up at night. also useful is a candy thermometer and a hard candy mold. To begin prepare your hard candy molds for the mixture OR grease a cookie sheet. Also have a small cup of cold water nearby. The 1/2 cup of super strong herbal tea can use a variety of different herbs. My latest favorite is equal parts bee balm (Monarda spp. ), sage (Salvia officinalis) and rosemary (Rosmarinus officinalis). Horehound (Marrubium vulgare) is, of course, famous as a cough drop as well. To make these, blend all ingredients in a medium to large saucepan. Stir constantly on high heat until the temperature reaches 300 degrees F, OR the mixture solidifies when dropped into the cool water. Once it is ready, pour into the hard candy molds (or greased cookie sheet), let cool and then store until needed. Some people coat each piece of candy with powdered sugar to keep it from sticking to one another. Powdered herbs (rose petals, yum!) can be used as well. To see a step by step photo essay of this recipe click here. One of the most important aspects of a cold or flu that is often overlooked is recovery. Rest is by-far the most important medicine! A generic recovery infusion could look like this. Place herbs in a quart jar, pour just boiled water over them, steep covered for four hours, strain and drink 1 quart a day for several days after symptoms have disappeared. The best time to think about the cold and flu season is when you are healthy and full of medicine making energy. Herbs I like to always have one hand are fresh garlic, onions and ginger and dried sage, thyme, bee balm, boneset and elderflowers. And don’t forget the honey! This article was originally published in Plant Healer Magazine.